I have a complicated relationship with sweet potatoes. I think they’re one of these wonder vegetables — impossible to mess up cooking, pretty consistently delicious whether you buy them freshly-dug from the farmers market or from a grocery chain, aglow with vitamins A and C and chock full of fiber. [Which I mostly think about because I’m the mother of a sweet potato junkie.] I like them in cake, sweet biscuits and pie. I like them with goat cheese and a light vinaigrette, gratin-ed with a tangle of chard, with a strange-but-addictive mix of spices and roasted in wedges, and one-bowl-meal-ed with roasted broccoli, black rice and miso sauce. But I also have all sorts of quibbles with them. They’re never crispy enough. They’re rarely savory enough — basically, if you get within 10 feet of my savory sweet potato dish with cinnamon, I go into hiding. For me, the louder the contrast between their sweet, soft nature, the happier I am eating them. Which means that it was only a matter of time before I took this pretty-pretty crispy potato roast from the archives and tried to put a Thanksgiving spin on it. The ta-da factor is strong here and the workload manageable. You thinly slice a whole lot of sweet potatoes and arrange them in a butter and olive oil-brushed dish, and brush them with even more. You can slide slivers of shallots between the sweet potato pages. You’ll want to shower the whole thing with salt and black pepper or red pepper flakes. You bake it with foil on long enough that the insides get tender and without foil long enough to get the tops brown and crispy. This is not your standard holiday sweet potato mash. I went a step further with something of a Thanksgiving salsa verde, or perhaps a Simon and Garfunkel salsa verde? I’d intended to just make it with parsley, but once I realized that the only herbs that survived early November in my short-lived herb garden were the sage, rosemary and thyme, well, you know, I just had to. It’s minced up with garlic, capers, lemon zest and olive oil, salt and pepper flakes. We liked it with the potatoes, but it may not be for everyone. I don’t think these would be unwelcome with any contrasting sauce you might prefer — perhaps this chile-lime vinaigrette or even a lemon-sumac dressing. You can go more classic, with some crème fraîche, thinned until drizzle-able with milk and scattered with chives and parsley. But if you do that, you have to promise to invite me too. Thanksgiving is on Pinterest this year: The Smitten Kitchen Pinterest page is all decked out for November and December. Need more Pumpkin ideas? Savory or Sweet Thanksgiving ideas? Homemade Food Gifts? Or maybe just All The Cookies? So do we, and we’ve got you covered. The only thing that you might find exasperating about this recipe is how hard it is to get the measurements just right. I used a 2-quart oval baking dish and needed 5 pounds of smallish sweet potatoes to fill it. If yours are smaller or thinner, you might need fewer pounds. If yours are thicker, you might want to safely buy 6 pounds. It seems safest to buy a little extra, just in case. Mine baked in an hour, but thicker-sliced potatoes could take up to 15 minutes longer. You can absolutely make this ahead of time. It will warm well wherever you go. It can be made up to two days in advance, and still taste as good as day one. Heat oven to 375°F (190°C). Heat butter and oil together until butter has melted. Pour 2 tablespoons of the mixture in the bottom of a 2-quart baking dish. (Mine is 9.5-by-12-inches, if that helps.) Sprinkle butter/oil puddle with some salt and pepper. 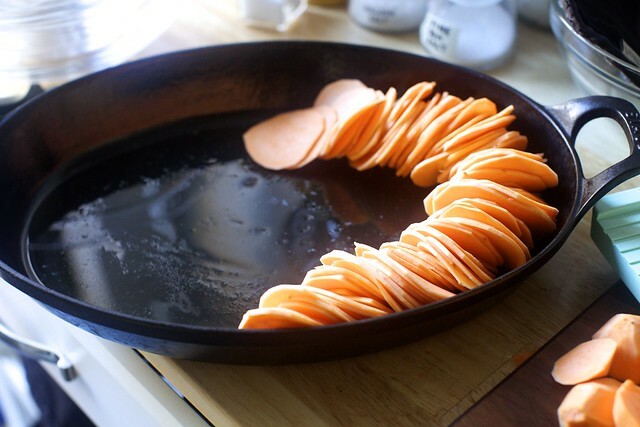 Arrange your potato slices vertically in the dish. Add a sliver of shallot between every few slices of potato, if desired. Brush tops of potatoes with remaining butter/oil and season generously with more salt and pepper. Cover dish with foil and bake for 45 to 50 minutes, until potatoes are tender and almost fully cooked. Increase oven heat to 450æF (230°C), remove foil and let roast another 10 to 20 minutes, until tops of potatoes are nicely browned. If you’d like to finish this with the Thanksgiving Salsa Verde I show here, or at least serve it on the side, place 1 scant cup of parsley leaves, 1 tablespoon fresh rosemary, 1 generous teaspoon of fresh thyme and sage leaves, 1 small garlic clove, the zest of 1/2 a lemon and 2 teaspoons capers (rinsed and drained if salted) in a food processor or blender and blend until finely chopped. Drizzle in 7 tablespoons olive oil with the machine running, or enough the mixture is loose and somewhat pourable. Season well with salt and pepper flakes. Damn, is that gorgeous. I might be bringing this to Friendsgiving next Friday. Looks delicious! Can’t wait to try this new twist on an old favorite. Oh Deb! This looks wonderful! I’m totally trying this tonight! This looks unbelievable, and it will absolutely be making an appearance on our Thanksgiving table! I’m going to be chuckling about J in that coat all.day.long. Love it. Yum!!! I’m making a list of all the veggie dishes I want to make for Thanksgiving and this just moved to the very top. Absolutely gorgeous!! This looks very yummy! !how difficult was it to get the potatoes sliced so thin? Did you use a knife or a mandolin? I always find them to be rather dense and difficult to cut nicely! Gorgeous! Such a nice alternative to other sides – there’s so much soft food at Thanksgiving (stuffing, pureed squash, mashed potatoes, etc.) that’s it’s nice to have a dish with some body. Btw, your thoughts on the never-savory-enough aspect of sweet potatoes echo mine exactly and explain why I never liked sweet potato fries: ketchup isn’t enough of a contrast to the fries and only enhances their sweetness with its own sugary taste. A nice garlicky mayo or aioli is a much better pairing, in my opinion (though it probably does negate the health benefits of the sweet potato fries!). The last few years we’ve deep-fried our turkeys, and usually make sweet potato fries while the birds rest, since we have everything out anyway. (Poutine, too!) But we just his minute decided to do the sweet potatoes this way next week….someone gave me a spiralizer several weeks ago and I bet that’ll make this even quicker to prepare. Such a gorgeous dish. This is definitely going on my Thanksgiving menu this year! What an amazing presentation here! Makes me want to rethink some of my Thanksgiving menu plans! Can you elaborate how this is made ahead of time? Do you do everything and bake it completely and then just reheat day of (at 375 or just 200 to get it warm?) Or do you arrange everything and bake the day-of? Thank you! Definitely adding this to my menu. This looks absolutely fabulous and a welcome change from sweet potato mush. Any chance it can be made ahead of time? Wow. Wow. You convinced me to change my sweet potato dish. Gorgeous. That is amazing looking! Sort of a more elegant dinner table version of sweet potato fries or chips. Regarding make-ahead and warming; would you maybe just bake through through the foil stage initially, cool and store and leave the foil-less crisping phase for your warm-up for service? YES! I need to know this too. I really want to do ahead but worried about the crispiness! Help us DEB! To rewarm, I’d say foil on until they’re hot then foil off for a few minutes to restore crisp. Perfect for my menu! Quick question about the baking vessel – I see that you’re using a Staub Cast Iron baking dish…do you think it makes a difference (less crispy? different baking time?) if you use ceramic? This looks amaaaaazing – and I am totally with you on cinnamon + sweet potatoes. I hated sweet potatoes for years because I was only familiar with the vegetable-as-dessert sort of preparation. 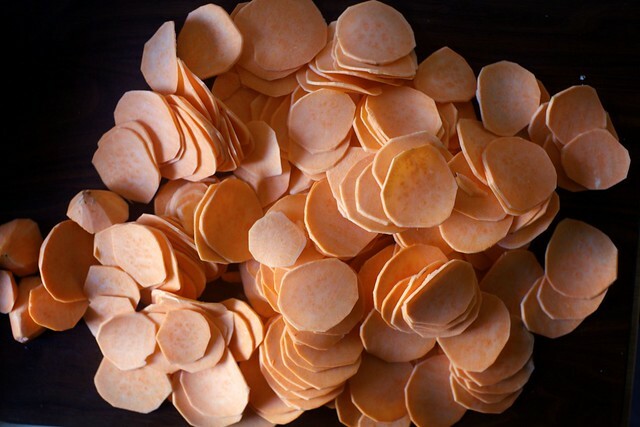 When you say “sliced thin,” is a standard food processor slicing blade thin enough, or does this really need a mandoline/rock star knife skills? This is perfect timing! I just heard myself promising my mother in law I’d make a sweet potato side dish for Thanksgiving, and there’s no way I could abide by the horrible typical marshmallow thing. Thanks for the make ahead tips too, can’t wait to try this one out! I’d also love details on making ahead of time! Everyone at Thanksgiving would be stunned if I showed up with something this spectacular. I enjoy sweet potatoes both in sweet and savory dishes. This looks gorgeous! Love that it’s crispy. This summer, I had an empanada that was filled with sweet potato, poblano peppers and goat cheese that was A. Mazing. I wanted to make that into some sort of dish for Thanksgiving and this is the perfect structure. I am going to put substitute the scallions with poblanos and make a little chimichurri sauce to drizzle on top along with the goat cheese crumbles. Viola! Thanks, Smitten Kitchen! Is that a cast iron gratin pan? Do you feel like the potatoes crisp up better that way or will a stoneware one work just as well? I’m not waiting until Thanksgiving. I’m making it this weekend! Along with your sausage and sweet potato soup, which is one of our favs! YUM! I usually do my holiday sweet potatoes with maple, chipotle, ancho, smoked paprika, and fresh italian parsley on top post roasting. This is exactly what I wanted to make for Thanksgiving!! I was looking up recipes for Hasselback potatoes and potato anna, and trying to decide if I was brave enough to make it up on my own. THANK YOU!! so what IS the difference between sweet potatoes and yams?? I am feeling daunted by those gorgeous slices, good thing it can be made ahead…it’ll take me several days!!!! 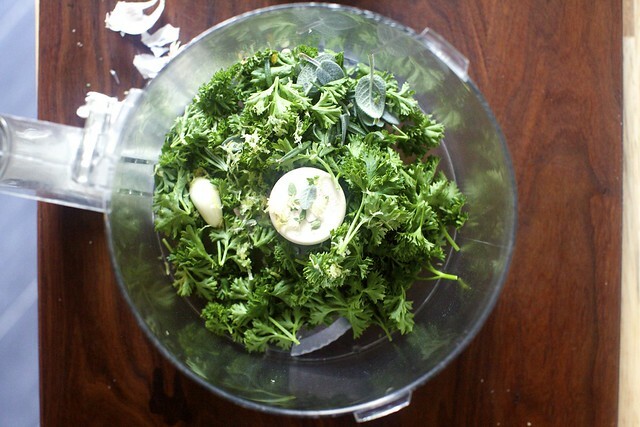 Will the food processor do it as nicely? Seems that I would never be able to fit a whole sweet potato into the tube of mine. I would probably have to halve or quarter them, thereby eliminating the “wow” factor.I will make these anyway, but will try it for “private consumption” first. Ideas anyone? Deb, this looks amazing! I’d like to make it the day before, and I know you say it will be good, but will it really be crispy that way? The crispy part is definitely my priority here! My husband would LOVE these…he doesn’t like his sweet potatoes sweet either ;) These look so crispy and perfect! Girl, making up to two days in advance is my love language for Thanksgiving, especially since we’re hosting 15+ this year. Yay!! This is perfect!!! The only ‘traditional’ food we skip on thanksgiving is the mashed potatoes, finally a good potato recipe swap!! I can’t wait to make this! Thank you!! Not only does this look stunning, I think the crispiness provides an important contrast to the soft texture of so many other thanksgiving staples. Lovely! I love this blog!!! You are so creative in your cooking and your writing! Question: Can you freeze before baking or after par-baking? Monica — I’d be sure to blast it at a high temperature to make sure the upper crisp comes back when reheating it, towards the end. Marcia — I’ve never tried freezing a dish like this before so I don’t know whether it would work or not. Yams vs. sweet potatoes — Everything we call yams in this country are in fact sweet potatoes. (Yams are native to Africa and Asia; they’re starchy tubers that have an almost black bark-like skin and white, purple or reddish flesh.) Read more here. Clever Girl — I definitely think you could use the same flavors here. Molly, Melissa — It is cast-iron but you can use any kind if dish that you have. Cast iron does seem to give food a nice crisp (you could also use a cast-iron skillet, to be extra rustic) but I used a Pyrex baking dish (ceramic) last time I made this and it crisped up just fine. Food processor for slicing — You know, I haven’t tried slicing potatoes in mine. Will it give you even coins? If so, should work. I Can Be Jell-O — Either way will work. Stunning! What a great looking dish to bring to Thanksgiving dinner. What Jamie said (@#37). Thanks Deb! This looks awesome, but in my Thanksgiving book, sweet potatoes have their own category, and it does not count as a vegetable. So, I think you owe us one more recipe before Thanksgiving. Please? Be your best friend? wow this sounds fabulous thanks for the recipe. I know it may seem easy to you cookers but to me, microwaving and mashing is the extent of my culinary skills but it looks wonderful.And Julie, love the term Friendsgiving. EXACTLY what we were looking for! Two questions: How thin is “cut thin?” Yours look to be maybe 1/8″? or less? Also, if I slice and assemble and brush the day before, are you thinking the potatoes won’t discolor, or better to just assemble & bake then, the day of, crank up the heat (per your response to I Can Be Jello) to 375 and re-crisp? THANK YOU! This looks perfect!!! I feel the same way about sweet potatoes – I love them, but they have got to be mad savory for me to really go crazy for them. This is beautiful, and I love the green contrast. The way I’ve been making them for Tg for years is in a gratin with a ton of garlic and salty butter and parmesan and breadcrumbs, the thinner the layer the better, b/c the top gets all crispy, crunchy with the parmesan and buttery breadcrumbs. The presentation here is gorgeous though, and I don’t tend to use my giant cast iron pan for the holiday, so it’ll be available! :) Thanks! Pretty sure this is genius. I’m a lover of all things sweet potato as well. Maple roasted are my current fav. Thanks for sharing this savory version! I’ll have to try this. It seems like a way to make sweet potato fries without the time and mess that tends to be involved with that. I love that these look crispy! That is my one problem with sweet potatoes, they never get crispy enough unless they’re fried, which I’d rather not do most of the time! These look amazing. These look fantastic! I too love sweet potatoes but do end p finding I tend to cook them in only a couple ways. I toyed with trying to think up a sweet potato recipe myself for Thanksgiving but shelved the idea, but these look like a great way to do them. Yum! that looks sooooo divine. The fact that I’m dorming and unable to reach a decent kitchen is killing me. Strawberry cake (my sister’s only birthday cake choice) time of year where I am . God they are good this season. But we have plenty of sweet potato around as well so I can see this fitting in well with a barbecue. if i precut the yams ahead of time, how could i keep them so they’ll last for when i’m ready to cook them? I have used a food processor to slice potatoes ,and it works very well..you just have to buy potatoes whose diameter will fit in the tube, and then guide them / stabilise them with the pusher. I do this for potato gratins frequently, because I have an irrational (?) fear of mandolines . So not irrational I sliced off a section of the front of my finger with a mandoline and I have a nice scar….I love your idea! So gorgeous! Look delicious too. There is a very clear difference between Sweet Potatoes and Yams. Sweet Potatoes are light yellow in color, less sweet, and more crumbly than Yams. Yams are more orange, much sweeter, and when cooked generally have a softer texture. Another difference: When cooked, Sweet Potatoes taste a bit like roasted chestnuts, but Yams taste almost like a sweet butternut squash or pumpkin. So, I have to ask: Exactly which vegetables are you using here? Yams? or Sweet Potatoes? So many recipes these days simply ask for Sweet Potatoes… but in the photos they look exactly like Yams. Which do you use in this recipe? (which sounds divine, btw). I would guess you’re using Yams, hence the sweet creamy center & the sticky crispy edges. This recipe will also taste really good with Sweet Potatoes, but won’t be as sweet, and will definitely have the chestnut flavor running through it. But I’d like to know which type to buy, to get the results that You have here. It looks wonderful… using either type of sweet-ish potato. Oops… my mother was wrong… hence… i am wrong… i just read an article that says Yams are the light colored, less sweet, more dry version… and Sweet Potatoes are the orange, sweet, softer, moister veggie… after 64 years of believing my Dearly Departed and Fabulous Cook Mama… I apologize for the previous posting… OK.. you are using the Sweet, Sweet Potato.. orange, and creamy… Gotcha… and it will be absolutely Yummy. 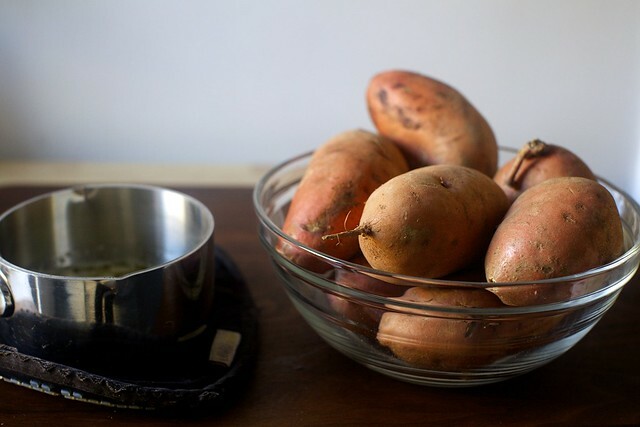 I may also try them sometime, with the less sweet Yams… they will be different.. but they will still be tasty.. I love both types of these guys. It’s certainly hard to know what people are talking about. Have you tried growing chervil? It looks so fragile, yet survives in my garden through the winter. It self seeds so you never lose it once you have it. And it is a superb culinary herb! Oh my gosh. I just bought a pastry brush. Its a long shot but I feel like that is the most excellent reason to make this recipe. Although I feel like I now need to buy a mandolin. Christmas list! Done. Please let me know which mandolin you use. Been putting off investment for a year, I go into shut-down mode looking at all the different brands/models. Recipe looks wonderful! Can’t wait to try! Also where did you get that adorable coat for your son? 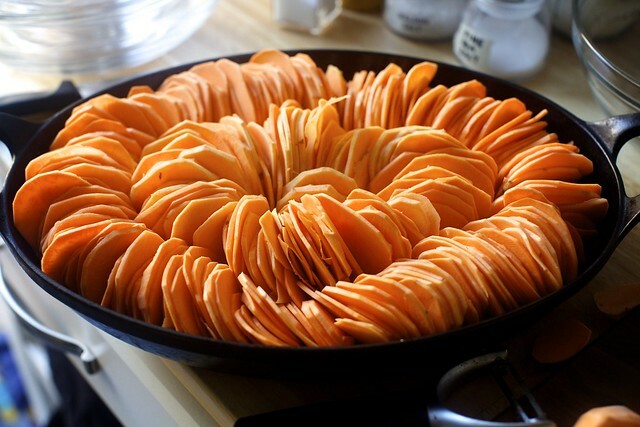 this looks absolutely sensational…although I think I’d need a small army of people to help me slice those potatoes! As a vegan alternative, can you use make it with coconut oi, instead of butter? Beautiful!! We eat sweet potatoes year round so this is a great addition to our menus. Bring your thyme and rosemary in ASAP and find a nice sunny ledge for them. You’ll love having them to pinch from during the winter. If you have your sage in a big pot, it may come back in the spring if you keep it in a sheltered area outside. Thank you for giving the pan size in both quarts AND inches. I have several oval bakers of different dimensions and I’m never sure of their quart capacity. I do have a tape measure. I’m definitely making this for our very small family thanksgiving (4 people) but I will make a smaller version. GREAT looking recipe, and I apologize in a advance, Deb, but I don’t remember — altho I’m sure you’ve mentioned it previously — what the standard amount of servings is for your recipes. I’m thrilled to be able to make this (just purchased a Mandolin) ahead of time for Turkey Day, so thanks for that, too. I would love to make this dish. However, as others have stated it is hard to cut a sweet potato – harder than a regular potato. How did you cut all those thin slices? If you used a mandolin, what kind? 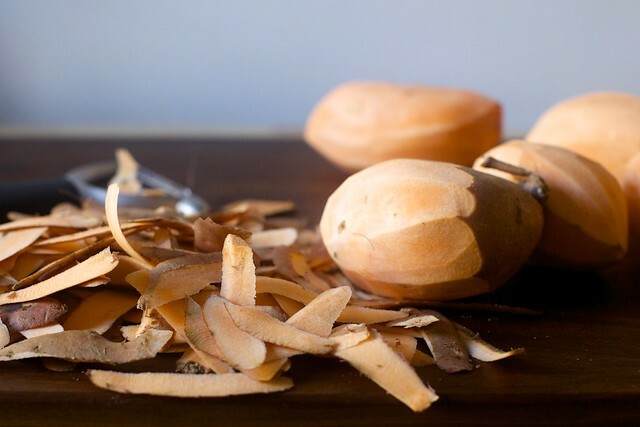 What are some brands of mandolins that would cut sweet potatoes? Holy Moly! Can’t wait to try this for Thanksgiving. Each year I try to find a sweet potato recipe that is not ladden with maple syrup, cinnamon, or marshmallows! This looks not only delicious, but the presentation is very nice! TO answer Rebecca, get a mandolin food slicer…makes perfect slices…just be very careful to keep your fingers away from the blade…trust me, I know…you can really cut yourself badly if you don’t protect your fingers! This is beautiful, perfect for fall and seems like it would be delicious! I think I see you have a Benriner mandolin; I’ve been using one but recently bought this one: http://www.amazon.com/gp/product/B005HC80J4/ref=oh_aui_detailpage_o00_s00?ie=UTF8&psc=1 .. Kyocera .. I haven’t tried it out yet but I liked the reviews. I would never use one without a cut resistant glove; they are washable. I even use it when I grate carrots or parm or zest a lemon or ginger. This is the one I have from Chef’s catalog: http://www.chefscatalog.com/product/24729-cut-resistant-glove.aspx There are other brands that are less expensive on Amazon but I don’t know if they are as good. Marcia — There isn’t a standard serving amount, but most range from 4 to 8. This is definitely in the 8-or-more zone, depending on how many other dishes you’ll have out. Andrea — Yes, or you could just use all olive oil. Sue — Whoops, now fixed, thanks. Connie — I think you could just put them in a freezer bag. I love the frilly look of this dish. So pretty! HI! This looks divine, but I have to agree with Jenn (commenter #44). Anything potato doesn’t count as what we wanted for a VEGETABLE side! Something green to break up the otherwise beige-to-brown color scheme is what we need. As Jenn said, you still owe us that! This is so beautiful and clever! I included a link to this recipe in my Thanksgiving inspiration post. I hope you don’t mind me sharing! Deb!! I love this!!! Can’t wait to make it!! But I’d like to echo the others and see what you think?… was hoping to bring this to a Thanksgiving we are going to. What (if anything) can be done before hand? Will the potatoes brown if left uncooked? If it’s already cooked, I saw you said to re-crisp it in the oven…but will that make it overdone? Thank you so much for sharing the recipe :D i have to try it!!!! I have tons of sweet potatoes, I can’t wait to try this! Looks beautiful and delicious! Thanks for this veggie adventure, Deb. I don’t think you owe us anything. We owe you–big time. I bring my potted rosemary plants inside in the fall, but here in Maryland the thyme survives outside all winter long. My sage survived in the ground for decades, but suddenly died out last winter and had to be replaced. And I don’t think there is anything irrational about fear of the mandoline! Have you ever tried chipotle chili powder with sweet potatoes? Life changing! Love how crispy these look. this is like a giant hasselback sweet potato! i love it. 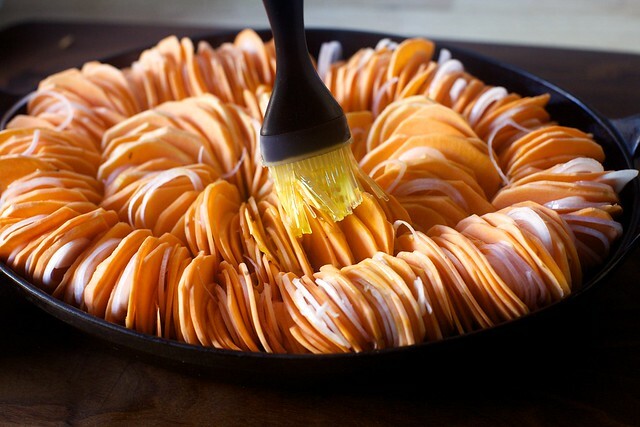 What a wonderful way to fix sweet potatoes. Kind of a huge hasselback sweet potato. How cool is that? I love that it’s crispy. IMO, sweet potatoes can do no wrong. This looks amazing! That looks so tasty! and so simple! OH MY I can’t wait to try this one as I LOVE LOVE LOVE the crispy potato roast and make that all the time!!!!!!! Just FYI Penzey’s carries Sumac. I am so trying this- minus the Brussels sprouts and trading in kale. Thanks! I made this tonight and topped with some leftover creme fraiche, it was great! The texture turned out perfectly. I used only 2 lbs of sweet potatoes and scaled everything down accordingly, but used all the same cooking times, 45 mins covered, 10 uncovered. Excellent savory option! So simple and yet so good. I added some traditional Indian spices to the top. It definitely brightened the flavor! 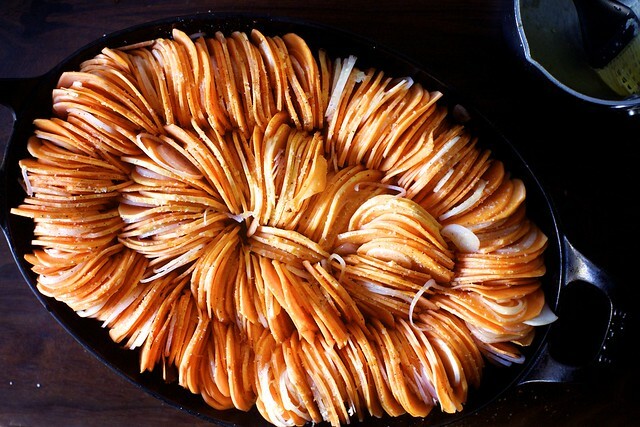 These potatoes remind me of this riff on scalloped potatoes–http://www.seriouseats.com/2013/12/the-food-lab-hasselback-potato-gratin-the-best-potatoes-ever-recipe.html. Scalloped potatoes is a dish that usually underwhelms me, but this version is so. freaking. good. this is magnificent! would this be good using russets? most of my weird family isn’t crazy about swet. This looks beautiful! I do love that there isn’t a hint of sugar or marshmallows (blech!!) on this sweet potato dish. I have the same issues with sweet potatoes that you do – I love the idea but can’t stand the thought of potatoes being a sweet dish instead of savory. I would definitely add the salsa on top of this to make it even more savory. In any case, I was not deterred. I had sliced up most of the sweet potato before this slip-up, and so I finished up the dish in the eveningn and put it into a smaller baking dish and roasted this up. This was EXCEPTIONALLY GOOD! And reheated the next day in the toaster oven? Nom nom nom! Delicious recipe! So super tasty! i am currently making your apple pie from the book ahead of thanksgiving. I am a little bit confused as to one of the steps and was wondering if you could help clarify. I asked for a mandolin for Christmas. Fingers crossed I receive one to make my crispy-sweet-potato dreams come true! I made this tonight and it was GREAT. I added a bit of fresh thyme both underneath and on top! I halved the recipe and put it in a 1quart oval dish. I also found that with really large potatoes I halved the slices and put the curved side up and they fit really well in the dish. At the end my oven didn’t brown it very well so I tossed it under the broiler and watched it like a hawk! I’m bringing two/three of your recipes to Thanksgiving (green bean casserole, cheese straws that my cousin told me I HAD to make, and maybe cranberry sauce).Thanks for another great recipe! oh great, thanks deb! i had JUST decided with my tgiving partner that we weren’t going to do sweet potatoes because we are bored of them. now you give me this! i’m not going to get anything done next week. Made this tonight for our friendsgiving. I topped it with thinned Mexican crema mixed with minced chipotle in adobo. It was a hit! Thank you for a great recipe. By the way, I sliced the sweet potatoes by hand and it wasn’t as difficult as I thought it would be. Dont let the the lack of a mandoline stop you from making this. I tried this recipe and figured I’d be clever and add thinly sliced potatoes and jerusalem artichokes…ummm not a great idea…the dish turned out as beautiful as the pics but i think the potatoes added that starchy uncooked potato taste even though they were cooked through. Also (and this may be due to my horrible temperature intractable oven) the potatoes did eventuslly crisp up at the top but the bottom half was more soggyish than I would have liked. Any thoughts to what I did wrong? The salsa verde was awesome – made it without capers because hubby doesn’t recognize their greatness, but still turned out delicious. i made this as described but sweet potatoes did not turn out crispy at all. The only difference was i used a pyrex dish rather than a cast iron one. Perhaps cast iron is the magic behind the illusive crispiness! So excited I make this for thanksgiving! Deb, do you have reheating suggestions? Should I fully cook it, then reheat, or partially cook, then finish off? (I’m hoping to make this the night before). Thanks for this recipe! hey Deb — what cast iron casserole/pan are you using? It’s gorgeous! Thanks for another Thanksgiving keeper (your sweet potatoes with goat cheese & vinaigrette is a weeknight staple!) . I made this with a mélange of sweet potatoes and russet, and added a teaspoon or so of dried sage, salt and pepper to the remaining butter/olive oil mixture…divine! They were crispy, sweet and tender, everything a potato should be! We dug sweet potatoes for the first time this fall! It was so fun, and they tasted so amazing! Made this for an early family thanksgiving yesterday and it was SUCH a hit! My mandolin had a hard time cutting the sweet potatoes, so I just cut them by hand and it wasn’t bad at all. Our local grocery store doesn’t carry creme fraiche, so I mixed some greek yogurt with a little buttermilk and half and half and drizzled over the top, finishing with some parsley and chives. I cooked it through the night before. When the turkey was finished, I threw it back in the oven with the other casseroles to crisp back up. My very averse-to-change family loved it, and it’s been approved as an addition to the line up! High praise, indeed. Thanks Deb! After reading Cate’s post (ouch, Cate), and knowing something similiar would happen to me, I decided to let my food processor take the risk. The slices were thin and even and I’m thrilled that I’m no longer tempted to buy a mandoline. I used the thinnest setting and within seconds I had my slices. I did edge the sweet potatoes to fit in the feed tube, but they still look good. The dish is in the oven and it smells fabulous. I sprinkled feta and toasted pine nuts on top, instead of the salsa verde…It was amazing! I showed the recipe to my hubby and he made it yesterday, using a mandoline. We didn’t have shallots, so he used yellow onions. Though a bit crispy on top, it came out mostly very soft… and very delicious! I halved the recipe and made it as a main dish to serve 4 (for a gluten-free, vegetarian dinner party). I crumbled feta cheese in the gaps and added some chilli and lemon juice to the salsa verde and the result was great. Served it with green salad, marinated peppers and walnut bread (for the gluten eaters). This was yummy, and I can’t to experiment with flavors suggested by your readers. My first try didn’t get crispy. Was there possibly too much oil/butter? Not enough heat at the end? Both? Do you have any tips on slicing the sweet potatoes? My mandoline and I do not always get along. And when I do get it to work, it slices them pretty thick. Yours look perfect!! Very delicious. Sprinkled za’atar on top and made a sauce of yogurt, tahini, lemon, and a bit of salt (a la Ottolenghi). Really, really good. Wondering whether you think this would work just as well with regular white potatoes? Thinking of doing this for Thanksgiving but we already have a sweet potato dish on the menu! Hi Becky — I did use a mandoline. Don’t be scared, just be careful. A lot of readers recommend these gloves, which take the scary out of using an adjustable-blade slider. I talk about the one I use in Comment #88.
susan — It’s hard to say, but you might try next time decreasing the proportion of time with the foil on/letting it bake longer without it before cranking up the heat for a final browning. ofoodie — It’s from Staub, this one. I stalked it until I found it on clearance somewhere a few years ago. Terri — You can probably 1.5x to 2x it in a 9×13 lasagna-ish dish. kate — I believe the goal, despite the confusing wording, was to get the apples into small chunks, as you see (I hope) in the pie photo, so small bits are the goal. I hope this helps. Cate — OMG! I am so sorry that happened. I am cringing, cringing so hard. Lady, you have to get yourself the gloves I mention to Becky above. I mean, little consolation now, I know. But at least it will never happen again. Hey, Deb! Yeah, after the incident, I’m pretty sure I’ll be getting a kevlar glove for Christmas ;) No worries! I’m pretty upbeat about the whole thing! Professional chefs go through life racking up scars and burns and pock-marks. I figure they lived through it, so I’ll deal! This does look amazing. I’m thinking of serving it with one of our favorite salsas for sweet potatoes: finely chopped jalapenos, green bell pepper and cilantro mixed with lime juice. Thankyou for replying, yes I cut them Into small chunks in the end. And not to worry, it wasn’t written confusingly, my foggy head did that all by itself. Very much looking forward to baking it Thursday morning. I have it fully frozen unbaked in the freezer, if I bake it straight from frozen how much longer do you think it should take, maybe half an hour? That salsa verde is to die for with yams! I loved this dish, beautiful presentation, but only the top was crispy (I cooked it in a cast iron pan). Still super delicious, I will make this again. Have you tried grilling them? I know living in NY with limited outdoor space probably prevents you from doing that, but I slice mine super thin, about this thickness, and then marinate in olive oil, garlic, herbs, seasoned salt and pepper then throw them on the grill on high for just a few min per side. I usually end up slightly burning a couple because they cook so fast on high heat. They get crispy on the edges and the charred bits are the best, much like roasted cabbage gets on high heat. Come to think of it, I might try grilling cabbage too now. Love my grill! Liz — No grill yet! (It’s completely and totally illegal for us, but we’re still debating how much we care.) But hopefully by next fall we can find out. It sounds delicious. And now I want grilled cabbage. Fantastic looking. I just whipped up a Chimichurri Sauce to top it off! Making it to take to friend’s house for Thanksgiving. I asked her to pick the dish she hated making the most and she said sweet potatoes. Bet she’ll be surprised with this! Beautiful presentation ! It reminds me of Remy`s ratatouille. I wanted to know what thickness setting your mandoline was set at. The thickness of the slices appears to be 1/4 or possibly 3/8 in. I looked for the information in the recipe but didn’t see it – did i miss it ? Well Deb, on your next tour I’m SURE you’ll make it to Victoria, BC and I will host you at Ferris’s Oyster Bar and Grill where the sweet potato fries are thin and crispy and served with mustard. The bite of the mustard in contrast with the sweetness is divine. Looks amazing I can tell from the photo it is delicious too. This will be first thing on my must try list. Thank you so much for this recipe. I have already made it twice! 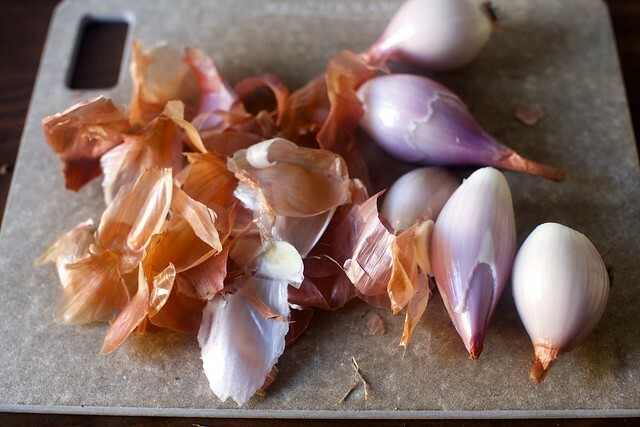 Great combination of beautiful and delicious- and the shallots elevate a vegetable nobody gets that excited about into something that disappears. It’s in the oven now! I too am a sweet potato lover!! We are going to a “waifs & strays” Christmas at a villa in Tuscany ( we live in Rome ) & this will be perfect with the roast Goose we have planned. They have a huge commercial oven, so hope I can get the temp right. Guess I’ll hit the Roman markets for a Mandolin… that’s a lot of slicing!! ach… I’ve read every comment and all of your responses but still not sure if there’s a definitive recommendation for those of us cooking and schlepping: do everything before (like NOW) and then repeat the sans-foil-high-temp-crisp at our TG destination OR save the last crisp step for the destination? i’m sure you’re elbow-deep in your own TG by now but help!! H.T.G.! 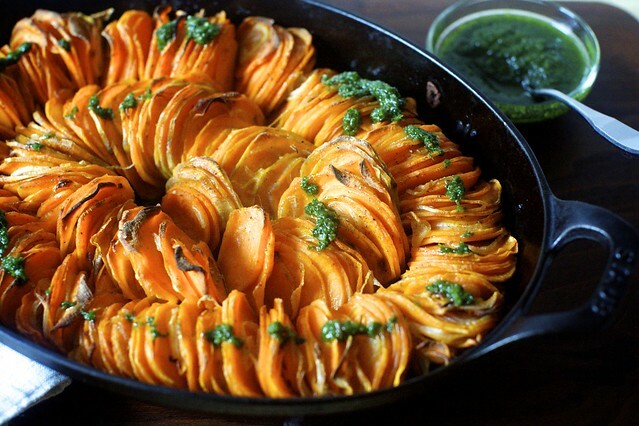 Another savory sweet potato lover rejoicing here– I can’t wait to make this! Have you tried that Ottolenghi recipe for roasted sweet potatoes and fresh figs (and one crucial chili pepper)? Based on what you’ve said here, I have a feeling you would love it as a jumping-off point for sweet potato salad-y things. Deb – How much salt would you say you used for that amount of potatoes? I think I tend to either undersalt or way oversalt and since I am making this for someone’s party tomorrow I need to get it right! Thanks! ana — With sweet potatoes, I always end up undersalting, personally so my answer is: more! But if you’re an oversalter, perhaps somewhere in the middle is best. I just made this ahead. Instead of the salsa Verde, I crumbled bacon and blue cheese on top. Can’t wait to try it! I made this tonight and it was unreal! The shallots impart an exceptional flavor, and the sweet potatoes were the right mix of crunchy and soft. Can’t wait to eat the rest tomorrow. Thank you! I just made the slices using a 2 mm blade on my food processor and the slices are uniform, thin and gorgeous. I started using my mandolin and then switched. The food processor is much easier and the slices are perfect. I just made a version of this with white, orange, and purple sweet potatoes alternating like the sliced ratatouille. It’s so pretty! Thank you for the inspiration. Happy Thanksgiving! I, too, had “soggy bottoms.” Maybe my slices were too thin. Largest setting on Kyocera was 3.0. Next time, I’ll spray pan with Pam and not put melted butter & olive oil in pan; I’ll just drizzle on top and then watch to bake shorter time. Still tastes good. I did the slices of shallot but not the verde stuff. I’m sitting in the emergency room waiting to get my thumb sutured, after using a mandolin for the first time. I’m sad that I lost a 1/4″ of my thumb, but even sadder that I won’t get to finish making this dish today! Be careful with those mandolins, folks! And happy Thanksgiving! Travis — NOOOOO. I wish I could buy everyone cut-resistant gloves for Christmas. I hope you’re healing well. I would NEVER use a mandoline slicer w/out a cut resistant glove. I use the glove when I grate ginger, etc. on a rasp so I don’t get bloody knuckles. Travis, I feel so sorry for you. Yams are really hard to push on the mandoline; a glove is mandatory! OMG, that was SO delicious. no sogginess in ours. I melted the butter and olive oil in the pan first, then poured some of it out to drizzle over the top, so there was a nice coating of fat on the bottom of the pan. I used the mandoline properly and had no accidents, thank goodness. we didn’t have shallots on hand (I decided to make this last-minute), so I used thin-thin slivers of yellow onion and they worked beautifully (I’m sure the shallots would have been even better; I’ll definitely try them next time). I didn’t use the parsley topping; I just drizzled the finished sweet potatoes with a bit of crème fraîche, and they were wonderful. the CHILDREN who have before only begrudgingly eaten sweet potatoes were *asking* for seconds and thirds. this is going to be a regular dish here. next time, I’ll try the recipe as written, but any way you make it, IMO, this is a winner! Thank you! Major success! Definitely was the most beautiful dish on the table. Didn’t have shallots on hand, so roasted just with oil, salt, pepper, and then garnished with feta, toasted pine-nuts, and a variation on the dressing (parsley, tons of garlic, olive oil). Sooo good. We included these potatoes on our Thanksgiving table, and they were wonderful! They were not even a tiny bit crispy, though no one seemed to mind a bit. :-) I browned the butter and added some ancho and aleppo. Beautiful and delicious. Thanks, Deb! I made this ahead of time (night before) only didn’t crisp it up until the day of TG, it was wonderful! I added a potato in order to fill in the gaps and make the slices stand up more, and finished it with the thinned creme fraiche/chives combination. Thanks, your column always provides inspiring ideas! So tasty! Made this yesterday (turkey day); sadly couldn’t find shallots so used thin red onion and garlic slices. Added a bit of cumin to the salt and pepper seasonings; made the chile-lime vinaigrette for people to top their own plates and brought it to my Colombian bf’s family. The vinaigrette reminded them all of ají and they used it for their turkey as well. I pre-baked it through all the steps, and would have popped it into the oven to get it crispy again, but it was already off when we got there so just did a quick warm up in the microwave, still good. Made it with the caper salsa. Delicious. Not as crispy, just very rustic looking. Great addition to our holiday table! Thank you. Long time reader first time commenter. This is a keeper. So good and after reading all these comments, have other ideas I just have to try. I’m getting old and want things simplified, so I just used a Pyrex bread pan and the did slices in rows across pan. Was simpler for me but not as beautiful to look at. Did not hurt the taste though. This looks so amazing! I can’t wait to get try it! Thank you for sharing! Made a half-sized version in my cast iron skillet for a Thanksgiving potluck and it was a HUGE hit!! So flavorful and the salsa verde (which I can’t help calling Scarborough Fair sauce) was drizzled over everything in sight :) This is going into heavy fall rotation as I’ve been getting tons of sweet potatoes in my CSA boxes of late. Just wanted to post a thank you for your wonderful site and recipes that work right the first time! Made this for Thanksgiving; huge success!!!! Love the recipe it tasted good but the potatoes didn’t crips and advice on that ?!?! Beautiful dish. Relatively easy to make ( if you have a mandolin) and looks lovely among a Thanksgiving spread. I baked for 60 minutes and added 15 minutes under the broiler. In the end the taste was very mediocre. Not worth the trouble. Cate, I completely feel your pain. I used my mandolin as well and ended up slicing off the top of my pinky in the process. All I could say was “I was on my last potato!” Oh well, I too ended up making the dish after the catastrophe and found it to be a solid dish. I love that it is a great base and there is so much you can do with it. I baked my sweet potatoes with bacon strips covering the potatoes and then discarded afterwards. I made a mixture of honey and fresh maple syrup for a glaze. I left the mixture in a container on the table for people to drizzle on the own, if they were interested. Good flavor. I will top with crispy crumbled bacon next time and add some herbs. Thanks for the recipe, very gourmet looking. Thanks for a wonderful recipe! I made this for Thanksgiving this year and it was a big big hit. I didn’t use shallots (too $$$) but used slivers of red onion. I loved the onion-y hit between the sweets. I used my Oxo mandoline and was vewy vewy (chanelling Elmer Fudd) careful. No disaster here! I love sweet potatoes! I definitely will try your wonderful recipe! I have a sweet potato junkie at home as well! Greets! This was absolutely delicious! I ended up with the paler variety of ‘sweet potato’ and they were still very good. My guests loved the Thanksgiving salsa! It was so good, there was only a tablespoon or so left over! We made this at Thanksgiving to replace the traditional marshmallow covered sweet potato dish (which no one was ever a big fan of). Since my sister in law is on a nightshade free diet, I replaced the red papper flakes with sumac and served it with the suggested lemon-sumac dressing. I was quite nervous about cooking something completely new for Thanksgiving dinner but this was amazing! I upped the shallots a little bit as well. I ended up making this in 3 smaller dishes rather than one large one, for ease of passing around the table. It is a new staple for our Thanksgiving dinner! Also, I sliced the potatos and shallots in the morning and put them in a ziploc with no discoloration. Put the dish together about 7 hours after cutting. I loved this so much at Thanksgiving, that I made it with Yukon Gold potatoes for Shabbat the next night. I skipped the butter and stuck with olive oil. And the Thanksgiving salsa was to die for. I have yet to make a Smitten Kitchen Deb Perelman recipe that is not fabulous! I am thankful for you! Made this for Thanksgiving and it was everyone’s favorite! I poured coconut cream over it all to fill halfway, skipped the shallots and added a few unpeeled garlic cloves to roast instead, and sprinkled everything with fresh chopped thyme, rosemary and sage. Brushed with olive oil and salted with sea salt. The sweet potatoes absorbed most of the coconut milk, making it sweet and creamy on bottom and salty and crispy on top. Was really good : ) thank you. PS: I sliced mine by hand, feeling daunted at first but it went so quickly and easily with a sharp, heavy santoku it was no problem. Just beautiful and oh so yummy. Love your dedication. Inspirational! It looks like a masterpiece. I wonder how long it would take me to slice and and fill a dish that way. I love the idea of coconut milk, and sweet potatoes are my favorite, so I may just take on this daunting task. Thanks for the creative recipe. Thanks a lot for the detailed recipe. The crispy sweet potato roast is a mouth-watering treat. I will surely try it today. Have you tried Bobby Flay’s chipotle sweet potato gratin? It’s just a chipotle blended int cream, poured over thinly sliced sweet potatoes and baked for an hour-ish, covered for half the time. I discovered it on Chow years ago, and was happy to stumble across it again in Amanda Hesser’s NY Times anthology. Tried these for Thanksgiving 2014 and I’m pretty sure if I took, a poll of my 25 guests this would win the big fatty 1st prize for favorite dish on the table. Amazing! And I’m not even a huge sweet potato fan! Yum!!! I made this for Thanksgiving, and it was pretty great. I made the chili-lime vinaigrette to go with it. It was a hit, even with a bunch of unadventurous eaters. Thank you, these were a hit! Took another commenters suggestion and made a lime/sour cream/chipotle/cilantro sauce. Divine, and sooooo much better than the sweet marshmallow version! Wow. I might actually unbox the mandoline I’ve had for 5 years to make this one. I made this over this past weekend – mine did not get very crispy at all, but was still delicious! I think the problem was that I had them packed in to the cast iron skillet too tightly. I replaced the butte/oil with coconut oil, and it was fantastic! The nuttiness of the coconut really brought out the sweetness of the sweet potatoes. “lime/sour cream/chipotle/cilantro sauce” – woah. That sounds excellent. We made it tonight for New Year’s and just went with a lot of grated Manchego cheese (after a lengthy debate about whether to use that or feta, which I bet would also be fabulous). So many variations on this!! Small comment; sweet potatoes have no vitamin A in them at all. They have beta carotene which can be converted (in small limited amounts) into vitamin A in the body. (but young children make this conversion badly). True vitamin A can be found in liver and eggs. This is my my new favourite food. I made it with alternating slices of pale sweet potato and deep orange yam. Gorgeous and delicious! Just finished my first plate of this stuff – delicious! I had this recipe in the back of my mind for a while and finally tried it out this afternoon. I didn’t have all the herbs, so I made a chimichurri using parsley, jalapeno, lemon, garlic and olive oil – definitely did the trick. Thanks for sharing such a great new way to cook sweet potatoes! Made exactly as described, including the green salsa. Once again, Deb makes me look like a good cook! It was also really easy (with a mandoline) and beautiful to look at! I saw a version of this recipe that alternated sweet potatoes with Yukon Gold (both sliced thinly with a mandolin). They were tossed in olive oil and a bit of butter, and then seasoned with fresh black pepper and sea salt. The final touch was a sprinkling of fresh thyme over the top. I made the mistake of not covering them for the first 30-45 mins, so they didn’t soften as much as they needed, but after this article- they turned out perfectly. I prepped mine the night before and just covered the ceramic disk with plastic wrap, replacing it with foil right before I tossed it in the office. Considering how to explore making it a bit more savory for the next iteration. Perhaps an Indian spin with some coconut milk and curry spices? I’ll let you know how it turns out. Too late in the day yesterday, I remembered we were going to a “bring a dish” film night in the evening. I had some sad, neglected sweet potatoes in the fridge, so I made a version of this that went down a storm! I shelved the notion of such beautiful presentation in the name of speed… I first parboiled the sliced sweet potatoes very briefly – so they were just tender, but not soft. Drained them; let them steam out a bit to dry; dressed with olive oil, s & p, garlic and chilli powder. Added some roasted red onion wedges from an earlier abandoned idea, plus the finely sliced shallots, then slung everything in a dish. Was nicely roasted after about 20 mins. As it turned out, I used too much chilli powder, so poured some leftover cheesy-garlic sauce for balance. It was delicious and I’ll definitely make it again. My husband loves sweet potatoes, and this is a recipe that makes them savoury enough for me to enjoy too! Thank you so much for including the ten-foot rule between sweet potatoes and cinnamon! I love sweet potatoes just about anyway you could prepare them, especially caramelized, but cinnamon just ruins the whole thing. First time I got my kids to eat sweet potatoes! Game changer! Lindsay — I think you could do either. But if you’re planning to reheat, maybe cook to one shade less than darkly toasted so when you rewarm it (I’d do it with foil on until it’s warmed through, then off until crisp again) it doesn’t pick up too much color. Do you think this would work substituting the sweet potatoes for butternut squash? I love the presentation! Awesome recipe. I served this for Thanksgiving and my guests ate all 6 lbs of potatoes. This was the first time many had ever tasted sweet potatoes and they are now fans. Boo hoo, no leftovers! All those “I don’t like sweet potatoe” folks changed their minds. Just made this for thanksgiving, and my family loved it. I didn’t make the salsa because my family didn’t seem like they would be into it, so instead i minced a few cloves of garlic into the butter/oil mixture with some parsley and brushed that on top. It was really delicious, but i’m not sure I would say it was “crispy.” Maybe it needed a little longer than the recipe states, but unfortunately oven time is too precious at thanksgiving to go longer at a heat that nothing else required. I am going to reheat it tomorrow and see if i can get it a little crisper. I’d recommend for a pretty option for a holiday meal that does not involve any mushiness (since so many other staples are mushy). Hi Deb! As with your “Crispy Potato Roast”, I love the look of this dish… so different than the same old sweet potato casserole for the holidays! Can you please tell me how many servings this makes? Thanks! Lovely recipe. I alternated sweet potato (husband dislikes), turnip (I dislike), and new potato (both like), and added fresh thyme, minced garlic, plenty of salt and black pepper, a few pepper flakes and Espelette pepper (I live in France). Put it under the broiler for 10 minutes at the end to crisp it up — delicious. Already I have ideas exploding in my head. But first I will do them your way. OMG! This looks so good! I’m with you that sweet potatoes, especially on T-day, are way too often turned into what my children call “sweet potato glop”. You know, with marshmallows etc (shudder). I can’t wait to try this. I am hosting a small thanksgiving feast this year, and I definitely plan to make this. And that pesto looks amazing! I just made this. Delicious on the outside but kinda plain and mushy in the middle. Do you think I should put the butter/oil and salt and pepper mixture all over the slices? Instead of just on the bottom and top? i made this for thanksgiving and i’ve made a dish with a similar idea from serious eats with regular potatoes in the past, so i decided to use their method which is to butter the dish but then toss the slices in a big bowl with an additional butter mixture. i add a little cream (when you’re getting the slices coated i would liken the texture of the mixture to a very soft butter or a gloppy alfredo), rosemary, garlic powder, s&p. you use your hands to make sure all the slices are coated and then arrange them in the dish, and put the shallot slices in between, and skip the drizzling with butter. (i also added a few parsnips that i had to use up.) it’s a bit messy but it makes sure every slice has flavor. it was very good. That looks great! Do you think it would work to do this using butternut or some other type of winter squash instead of sweet potato? It might but I haven’t had much experience with cutting squash this thin, a little worried it might fall apart. I was beginning to think nobody felt the way I did about cinnamon and sweet potatoes! I thought I hated them until my 20s bec I’d only had them that way. Had one with just butter and salt and my mind was blown. Savory for life. I make tipsy sweet potatoes from a jack Daniels recipe. Use it every thanksgiving, Christmas and Easter and anytime in between. It is awesome. I am in charge of bringing sweet potatoes for Thanksgiving dinner. I must say these look gorgeous and delicious. Just wondering how you recommend reheating them. Thanks and Happy Thanksgiving! Foil on until they’re hot then foil off for a few minutes to restore crisp. I love this presentation and simplicity of the recipe. It’s all about the sweet potato. Hi Deb. I have peeled my potatoes, and I’m ready to slice them. How thin is “thinly sliced”? 1/4 inch? This will be the third year I make this for Thanksgiving. It’s wonderful and gets so many compliments. Thank you! Just made this for guests with small appetites, using fat carrots, parsnips and baby turnips interleaved instead of sweet potatoes. I used a bit under three pounds of mixed veg in a smaller dish. I added juice of half a lemon as well as zest to the salsa verde; it needed a bit more sharpness. I sliiced the veg using the food procesor (thin slice blade), and pre-baked yesterday with a splash of cider to moisten. To reheat, I brushed more oil over the top and added a bit more cider to keep moist. A showstopper with nothing left of veg or sauce, and raves for how amazing it looked. Thanks Deb for another great recipe! I made this last year and for whatever reason didn’t make the salsa verde. This year I did, and let me tell you, it takes this to a whole new level. That stuff was also great on the chicken I made. I also made it with some diced onion instead of the shallots because that is what I had and it was great. Made this for our Thanksgiving on Saturday. Sliced the potatoes with a mandolin and arranged in a spiral rose pattern. Beautiful! Cooked it a day ahead and then reheated to get some crisp. Served with the creme fraiche sauce; creme fraiche, milk, parsley, lemon, salt and pepper. It was a hit! I made this for Thanksgiving and it was a big hit. I loved that it wasn’t overly sweet and the parsley based “pesto” was a perfect touch. This is definitely a keeper! I made this for my family on Thanksgiving and everyone raved. One huge cast iron pan, 8 people and just enough leftovers by using 6 lbs of sweet potatoes. I basically only use your recipes now. They are fool-proof and amazing. Made this for Thanksgiving – looked amazing and fancy and everyone loved it! This recipe is excellent. I had trouble crisping up the potatoes at the end – our oven takes forever to heat, and when I tried to broiler, I couldn’t get an even crisp – but the flavor and consistency I did get were delicious. Thank you! I made this and possibly used too much oil as I still have quite bit bubbling away in the dish – should I drain it off?? You can absolutely drain off the excess oil. Hope it was a hit. I was wondering if there is a good substitute for the butter in this recipe, or if it would be all right to use all olive oil? There will be a vegan at my Easter table, and coconut oil is not an option. I know all the caramelly goodness that happens with butter is a big deal…. Anyone ever make a sweet version of this? Butter and brown sugar or maple syrup? Going to give it a shot for a thanksgiving. Top it with chopped pecans I think! Curious? Have you tried pouring coconut cream, nutmeg and cinnamon over these? 1) Does one need a cast iron pan to cook this and get the potatoes to crisp? 2) Can it be made in advance and if so which part? Should I do the whole thing and then re heat or just pre-bake and do the crisping on the day itself or will that not work? I’m not very adept with sweet potatoes…. Perhaps an odd question but do you thin that you could combine this recipe with the one about mustard potatoes and do a mustard sweet potatoe roast or would that be an odd marriage of flavours? I also prefer my sweet potatoes more on the savoury side…. This looks amazing and I’d love to try it! Seriously! :) The only issue I have with the post is there is no picture of it served. Gorgeous!!! I’m planning on making this for Thanksgiving 2017. Do you think this would be good with a light drizzle of pecan , brown sugar crumble since I’m replacing the traditional sweet potato casserole or you think stick with savory flavors only ? Happy Thanksgiving to you and your beautiful inside and out family ! Planning on trying the drizzle of pecans, brown sugar. Sorry, really do love a bit of sweet with my sweet potatoes, but LOVE the presentation. I made this for Thanksgiving last night. It didn’t look quite as beautiful as the one here but it sure tasted great. I kept it absolutely plain – butter, olive oil, salt and pepper. That’s it. The deep roasting really brought out the flavor of the sweet potatoes. People kept asking me, is there maple in this? cinnamon? It was super easy to prepare thanks to cutting the potatoes with a mandolin. I will definitely make this again. I made this recipe for the first time yesterday for Thanksgiving dinner. I usually don’t try out brand new recipes for a holiday meal with guests without testing it first, but it seemed simple enough. It was simple to make and everyone LOVED it!!! The hardest part was finding a baking dish that was the right size to hold the potato slices upright for the amount of potatoes we had. These are so delicious and savory – such a refreshing change from all the sugary sweet potato recipes that are everywhere for the holidays. The flavors were wonderful and really complimented the turkey, vegetables and other sides at our meal. This is definitely going to be part of our holiday recipe “canon” from now on – and probably in regular dinner rotation, too. I used three different sweet potatoes: white, orange and purple, made a beautiful dish! Everyone loved it! Never thought of making a savory dish with sweet potatoes but it was a hit! The sweet potato gives a magical taste when it is combined with the spices and topping with some of the fantastic ingredients. I like the potato recipe you have mentioned here, I will surely give this a try. So good! I’m making it again tonight! I just have to say that I have made this for two Thanksgiving’s running, and this year I will be making it for a Friendsgiving and the family Thanksgiving I host. It never fails to be amazingly delicious. I’ve never felt the need to top it with anything as the crispy roasted caramelized potatoes and shallots are delicious as-is. This year I might make the creme fraiche as an optional topping though. One year I used red onions as I forgot the shallots and it was also delicious. I have a feeling this dish won’t be leaving our Thanksgiving menu anytime soon. Thanks Deb! This looks awesome! I agree on the crispness issue, but find the white sweet potatoes crisp up much better. I always choose those when I make sweet potato fries-a healthier twist on the french fry for my 16 year old son! I will be making this one soon. I think it looks amazing with the orange ones! Deb, I am curious if you have tried doing this roast with the “slow roasted” method since you discovered that trick with sweet potatoes later, per your more recent posted Slow Roasted recipe. I’m thinking of using this slicing method and exact recipe only roasting covered with foil at 250 for four hours. I’m not as much after the crispness as I am the natural caramelization and appreciate this presentation. I will attempt to get some browning but not sure I could get them crispy cooking that slow. I will be using the 4qt version of your Staub piece. Let me know if you’ve tried anything new with this one and have any tips! Thank you!!! I’m a big fan of yours! Worked out well! Used a ton of fresh sage, Rosemary and thyme leaves on top and snuck in some radishes and beets with the sweet potatoes. Drizzled with some baslamic when it was hot. This is so delicious! I took it to a friend for dinner and we had it ourselves, too. It will be my go-to sweet potato recipe. It carmelizes the edges so nicely that I didn’t need additional butter or any other of the usual toppings – brown sugar, walnuts, etc! The butter puddles on the bottom of the pan so don’t count them all in the calorie count if you interested in those details. Thank you. Could I mix some white potatoes with the sweet potatoes or will they cook at different times? Check this recipe for a comparison!